A renowned children’s programme host in Hong Kong, Harry appeals to children and adults alike with his keen sense of humour and amazing magic. Music and magic have been part of his life since he was young and he has been serving the community by bringing joy to all with these gifted skills. Harry started hosting a children’s TV programme with Radio Television Hong Kong in 1986 before he joined Metro-Broadcast in 1991 as a bilingual DJ, and was later promoted to Channel Director for FM Select in 1996. 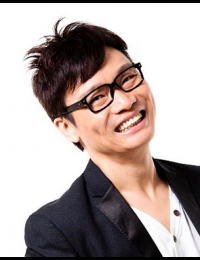 He has hosted children’s programmes on ATV and TVB, and is currently with i-Cable’s Kids Channel. Harry has been a guest performer with the Hong Kong Philharmonic Orchestra, the Hong Kong Dance Company and the Hong Kong Chinese Orchestra. While regularly turning out new shows for family audience of Hong Kong and Canada, he is also a much sought-after MC and entertainer for corporate events in various parts of the world. Stage performance aside, Harry is also the founder of the project, Healing-Magic, in 2001, through which he shares his magic with professional therapists to apply the art of magic and hypnosis for therapeutic use. As a leading specialist in children’s music education, Harry is currently the Artistic Director of the Hong Kong Arts Academy for Children and a member of the European Recorder Players’ Society. His series of music textbooks, Music Today, and his recorder methods have been widely adopted by primary schools throughout Hong Kong. Harry’s original compositions and Cantonese interpretations of Rick Scott songs are made into a CD album, The 5 Elements, which has won the 2004 North American Parenting Publications Gold Award and the 2004 Parents’ Choice Award in the USA. He is now the CEO of KIDO Town, a children education institution, aims to use Invitational Education to nurture young children.